Installing a new roof or replacing a damaged roof is a fairly large home improvement project. Collins Roofing & Solar Solutions have plenty of experience completing new roofs and we have an organised process that we follow meaning your roof installation, renovation or repair work can have an accurate deadline completion date. Due to the number of projects we have completed over the last 9 years in roofing, we are now extremely efficient with all roofing services jobs. Our aim is to continue producing the high level of service our customers have come to expect from us within reasonable timeframes that are always communicated clearly with you throughout any project being completed. A kit for scaling the roof that’s safe including scaffold a safety equipment. We sweep the roof clean of dirt and debris. set up ropes and safety equipment. make sure to look and call a noise below before dropping any roofing materials or debris. Use only safe ladders that are in good condition and can handle all of our team’s weight. Remove the old roof taking off sheets, shingles, nails and any debris or mess. We will likely use scaffolding depending on the size of the roof, for a “re-roof” or replacement roof there is no question we will need some assembled. We provide hires skips and will place all of the old roofs in them nice and tidy and we will arrange to have them picked up. We choose our materials carefully depending what roof you have we can use asphalt, rubber, tar, felt, tiles you name it we will source it. We complete the said job in the said timescale and get your feedback either as an online review or a conversation. If you have had a roof installed by us please leave us an online review. Scotland and especially Glasgow is home to many old buildings with old roofs. Many of these roofs require specific materials and in some cases planning permission, we have plenty of experience with these situations. Over time the roof of a property can expect maintenance its the same for every household, you can hardly leave even a minor fault in your homes main protection from the elements. Roof repair work varies and although we work on big contracts, the small roofing repairs and tiling, fascias, soffits, gutters and chimney repair type jobs are a large majority of what we learned during our trade. 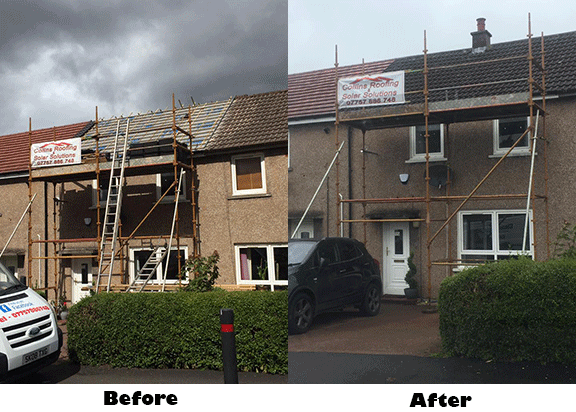 These roof repair and maintenance and are jobs we still carry out on a regular basis especially local areas like Bishopbriggs, Kirkintilloch, Cumbernauld and elsewhere in East Dunbartonshire. If there have been major or minor storm damage due to the countries fair share of adverse weather conditions and harsh winters, we will simply speak on the phone or reply to your email and arrange a visit for a free no obligation quote. Our prices are fair having a background in contracting and if we start the job we are sure you will be happy with the outcome and the fair price. Collins roofing & solar solutions built up the core of our business doing roofing repairs. 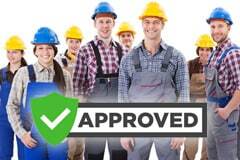 The main type of job we learned doing our roofing apprenticeship working as a subcontractor being self-employed and now an expertise that runs a succesful roofing company in Glasgow.